Anaplastic sarcoma of the kidney (ASK) is one of the rarest renal tumors. It is a hypercellular spindle cell tumor with widespread anaplastic changes plus chondroid differentiation in most cases. Only seven reports comprising 25 cases of ASK have been published in the English literature since Vujanić et al.first coined this term in 2007 ,,,,,,. 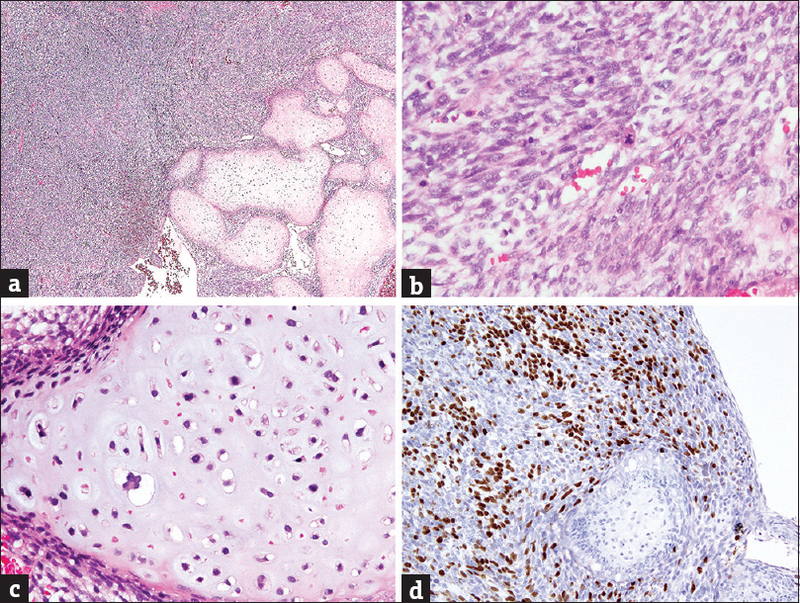 The histopathological differential diagnosis includes anaplastic Wilms tumor, mesenchymal chondrosarcoma, and sarcomatoid renal cell carcinoma. With no standardized treatment protocol, nephrectomy combined with adjuvant chemotherapy is the treatment modality applied to most of the patients. The prognosis is variable and appears to correlate with tumor staging. A 22-year-old woman with a history of asthma presented with gross hematuria for 1 month. She had visited local clinics where microcytic anemia was suspected. She visited our urology outpatient department for a second opinion. On physical examination, mild knocking pain was noted in her left flank. Urinalysis showed hematuria and mild pyuria. Abdominal ultrasonography showed a 9 cm iso- and hypo-echogenic renal mass, at the lower pole of her left kidney. A left renal malignancy with a perirenal hematoma was seen on computed tomography of the abdomen [Figure 1]a. She received a left radical nephrectomy. The resected kidney measured 16 cm × 15 cm × 5 cm. The kidney and perinephric tissue showed multiple foci of hemorrhage with a large hematoma. After cutting, there was one 9.5 cm × 7 cm × 4.5 cm tumorous mass at the lower pole of the kidney consisting of solid white components and hemorrhagic soft components [Figure 1]b. The tumor invaded the renal parenchyma, renal pelvis, and perinephric soft tissue. Microscopically, the tumor was composed mainly of sheets of spindle or oval undifferentiated cells admixed with foci of abrupt differentiation of cartilaginous nodules [Figure 2]a. The undifferentiated cells had ovoid to elongated hyperchromatic nuclei, indistinct cell borders and brisk mitoses (up to 20 mitoses per 10 high power fields) [Figure 2]b. Intermixed were some hemangiopericytoma-like vascular channels. Anaplastic cells with atypical mitoses or multinucleation were readily identified. Small areas of primitive blastema-like small blue round cells could also be observed within the undifferentiated component. For the cartilaginous nodules, the neoplastic chondroid cells also displayed atypical, enlarged and hyperchromatic nuclei, suggestive of a malignant morphology [Figure 2]c. No neoplastic epithelial elements, such as abortive tubules and glomeruli formation, were found in the tumor. Immunohistochemically, the undifferentiated component showed immunoreactivity for desmin, myogenin [Figure 2]d, vimentin, and neuron-specific enolase (focal), but were non-reactive for cytokeratin, smooth muscle actin, leukocyte common antigen, CD99, melan-A, inhibin-A, and HMB-45. The Ki-67 proliferation index was approximately 85%. The cartilaginous component was immunoreactive for S-100. The results of the WT1 stain were negative for both components. In summary, this was a sarcomatous tumor with focal myxoid and chondroid differentiation. ASK was diagnosed after a literature review The patient's postoperative recovery was uneventful, and she began adjuvant chemotherapy (ifosfamide [1800 mg/m2] and epirubicin [60 mg/m2]) 5 weeks after the operation. The patient remained disease-free for 3 months after the operation. ASK is a newly recognized neoplasm of the kidney, first described by Vujanić et al. in 2007 . They reviewed 13,000 cases of Wilms tumor and found 20 cases originally diagnosed as “unusual” anaplastic Wilms tumors with unique clinical and pathological characteristics. This led to the discovery of a new entity called “ASK.” Similar to our case, the majority of these tumors presented as a large renal mass affecting females. The right kidney is the preferred site, which differs from the present case. The age distribution of patients ranges from 10 months to 41 years . The gross findings of ASK in the literature were mostly solid with an occasional cystic component (up to one-third of the cases). The tumors ranged from 4 to 22 cm in diameter.4 Protrusion into the renal sinus could be seen in some of the cases, including our case. 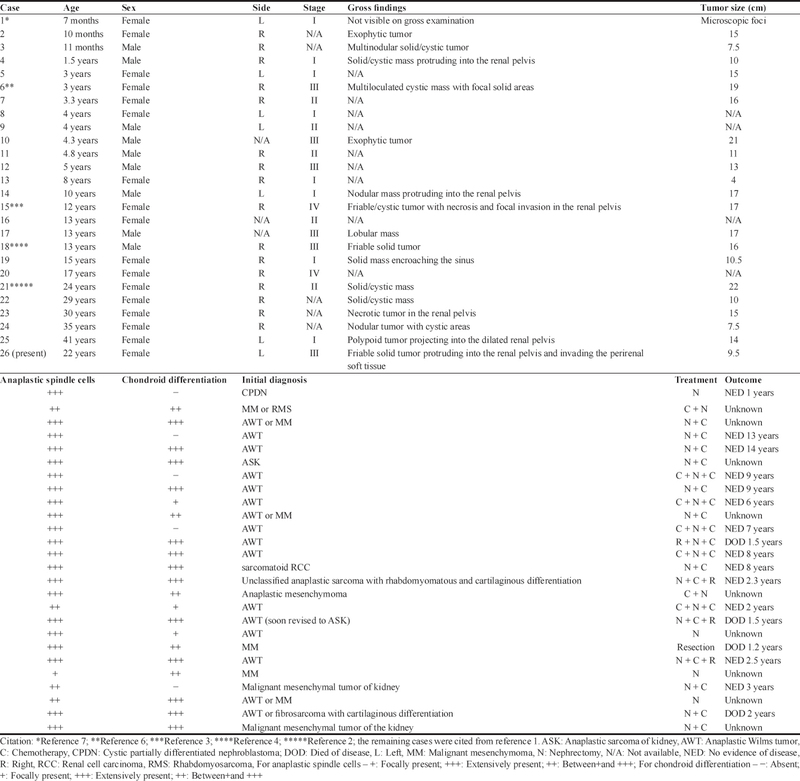 [Table 1] summarizes the clinical characteristics, macroscopic, and microscopic features, treatment, and outcomes of the 25 cases patients with ASK in the literature, including the present one. Histologically, ASK is composed of sheets of undifferentiated spindle cells with marked anaplasia and atypical mitotic figures. Rhabdoid differentiation is occasionally seen. Although morphologically rhabdoid cells cannot be found in this tumor, the rhabdoid phenotype can be clearly demonstrated by desmin and myogenin positivity in the anaplastic cells. There may also be foci of undifferentiated small round primitive mesenchymal cells (blastema-like cells). Chondroid differentiation with both benign and malignant morphology is readily seen. A myxoid matrix may be seen focally. The main pathological differential diagnosis includes anaplastic Wilms tumor, mesenchymal chondrosarcoma, sarcomatoid carcinoma, clear cell sarcoma of the kidney, rhabdoid tumor of the kidney, congenital mesoblastic nephroma, rhabdomyosarcoma, and synovial sarcoma. Heterologous chondroid differentiation may be observed in ASK, anaplastic Wilms tumor, sarcomatoid carcinoma, and mesenchymal chondrosarcoma, but is rarely seen in clear cell sarcoma of the kidney, rhabdoid tumor of the kidney, congenital mesoblastic nephroma, rhabdomyosarcoma, and synovial sarcoma. According to Arabi et al. , the most important entity to differentiate is anaplastic Wilms tumor. In contrast to anaplastic Wilms tumor, large areas of anaplastic cells and cartilage, absence of large areas of blastema-like cells, and WT1 negativity may favor a diagnosis of ASK. In our case, based on the patient's age, mesenchymal chondrosarcoma was also a possible diagnosis. However, large areas of undifferentiated cells with myogenin positivity along with CD99 negativity argued against such a diagnosis. For the remaining entities in the differential diagnosis, sarcomatoid carcinoma, rhabdoid tumor, and synovial sarcoma would typically show at least focal positivity of EMA and CK stains, but the results of these two stains were negative in this tumor. Clear cell sarcoma of the kidney would display diffuse and strong cyclin D1immunoreactivity , while the result of this stain was only focally positive for this tumor. Cellular congenital mesoblastic nephroma could be excluded by the negative stain for smooth muscle actin and the extensive presence of chondroid differentiation. In addition, given that at least biphenotypic differentiation (rhabdoid and chondroid) were observed within the tumor, a malignant mesenchymoma might be considered. However, this term has been discouraged since the publication of the WHO classification of tumors of bone and soft tissue in 2013 . After a literature review, ASK best fit the picture in the present case, although this entity was not included in the latest edition of the WHO classification of tumors of the urinary system and male genital organs . Most reported cases were treated by surgery with combined chemotherapy using the Wilms tumor or Ewing sarcoma protocol. The reported outcomes seem to correlate with tumor staging, ranging from death in 1.2 years in a Stage-IV case to free of disease after 14 years in a Stage-I case . The present case was Stage III, which has had variable reported outcomes from death in 1.5 years to free of disease in 2 years . Long-term follow-up is necessary. We would like to thank Dr. Pan, Chin-Chen, a pathologist specializing in renal and urinary pathology at Taipei Veterans General Hospital, Taipei, Taiwan, for consulting on this case. The authors certify that the patient has obtained an appropriate patient consent form. In the form, the patient has given her consent for her images and other clinical information to be reported in the journal. The patient understands that her name and initials will not be published and due efforts will be made to conceal her identity, but anonymity cannot be guaranteed. Vujanić GM, Kelsey A, Perlman EJ, Sandstedt B, Beckwith JB. Anaplastic sarcoma of the kidney: A clinicopathologic study of 20 cases of a new entity with polyphenotypic features. Am J Surg Pathol 2007;31:1459-68. Labanaris A, Zugor V, Smiszek R, Nützel R, Kühn R. Anaplastic sarcoma of the kidney. ScientificWorldJournal 2009;9:97-101. Gomi K, Hamanoue S, Tanaka M, Matsumoto M, Kitagawa N, Niwa T, et al. Anaplastic sarcoma of the kidney with chromosomal abnormality:First report on cytogenetic findings. Hum Pathol 2010;41:1495-9. Watanabe N, Omagari D, Yamada T, Nemoto N, Furuya T, Sugito K, et al. Anaplastic sarcoma of the kidney: Case report and literature review. Pediatr Int 2013;55:e129-32. Mirkovic J, Calicchio M, Fletcher CD, Perez-Atayde AR. Diffuse and strong cyclin D1 immunoreactivity in clear cell sarcoma of the kidney. Histopathology 2015;67:306-12. Arabi H, Al-Maghraby H, Yamani A, Yousef Y, Huwait H. Anaplastic sarcoma of the kidney: A rare unique renal neoplasm. Int J Surg Pathol 2016;24:556-61. Wu MK, Cotter MB, Pears J, McDermott MB, Fabian MR, Foulkes WD, et al. Tumor progression in DICER1-mutated cystic nephroma-witnessing the genesis of anaplastic sarcoma of the kidney. Hum Pathol 2016;53:114-20. Fletcher CD, Bridge JA, Hogendoorn CW, Mertens F. WHO Classification of tumors of bone and soft tissue. 4th ed. International Agency for Research on Cancer (IARC); 2013. p. 193-238. Moch H, Humphrey PA, Ulbright TM, Reuter VE. WHO classification of tumors of urinary system and male genital organs. 4th ed. IARC; 2016. p. 11-76.